The Cruise Examiner for 22nd December 2014... ..
Last week, as a result of a number of meetings in Canada that were arranged through the Vatican, President Obama surprised the world by announcing that after more than half a century, the United States would resume diplomatic relations with Cuba. Today, we have a look at what’s been happening in the cruise business in Cuba. Meanwhile, Costa Cruises’ Costa Celebration arrived in Freeport last Thursday to replace the damaged Bahamas Celebration on the Palm Beach-Freeport route – under her last name of Grand Celebration. What could be more appropriate?. Arriving in port that same week was the S F Alhucemas, a full-hulled replacement for the Fort Lauderdale-Freeport catamaran ferry. Both services will offer cruise and stay packages in conjunction with resort hotels in Grand Bahama, all backed by a $3 million advertising campaign by the Bahamian Government. The Cruise Examiner for 9th June 2014.. The illustrations for the new MSC “Seaside” class from Fincantieri have provoked some discussion on recent changes in cruise ship design, which we examine today. Elsewhere, Noble Caledonia last week also announced that it was acquiring a third unit of the original eight-ship 114-berth Renaissance small ship class, and the third of four sister ships from the Apuania shipyard south of La Spezia. Meanwhile, Louis Cruises is out to triple its French business to 10,000 passengers and has announced a second season for the Louis Cristal on charter to Cuba Cruise from Havana. Crystal Cruises has announced an extension until the end of April of its special offer fares for shorter 5, 6, 7 and 8-night cruises for summer 2013. These “Getaway” cruises allow busy executives and first-timers to sample the now all-inclusive Crystal ships at lower fares. While Silversea has also announced some 4 to 7-night cruises, Hapag-Lloyd Cruises’ new Europa 2 is due to enter service in May. Unlike the existing Europa, which offers longer cruises, she offers exclusively 7-night Mediterranean cruises this summer. Elsewhere, Cuba is back in the news with the announcement that Cuba Cruise will begin offering 7-night Round Cuba cruises from Havana this winter in the Louis Cristal. And CMA CGM, having opened up its largest container ship, CMA CGM Marco Polo, to passenger bookings, now offers almost 600 passenger berths on 70 ships on its various routes worldwide. Finally, Cruise & Maritime Voyages has just announced two South Africa liner voyages for the Astor in 2014. Cuba Cruise of Toronto has announced a new series of 7-night cruises around Cuba, departing from Havana. These will be offered in the 966-berth Louis Cristal. Cuba Cruise’s new recently-announced Havana season will run from December 16, 2013, to March 31, 2014, offering a total of fifteen departures. Cruise-only fares for the 7-night circumnavigation of Cuba will start at $586 in double occupancy and run to $1,204 per person in an Imperial Suite. Fly/cruise packages will also be available from Canada, the UK and Germany. Louis Cristal‘s 7-night cruise will leave Havana on Monday at midnight and call at Bahia Nipe, Cayo Coco, Holguin, Santiago de Cuba, Montego Bay (Jamaica), Cienfuegos, Trinidad and sail past Isla de la Juventud on the way back to Havana. It will also be possible to join ship on Fridays at Montego Bay in Jamaica, where departures are scheduled for 11 pm. With the exception of a 5 pm departure from Cayo Coco on Tuesdays, most port departures take place between 9 pm and midnight, giving plenty of time to explore ashore. Included on or near her itinerary will be six UNESCO World Heritage sites and four national parks. 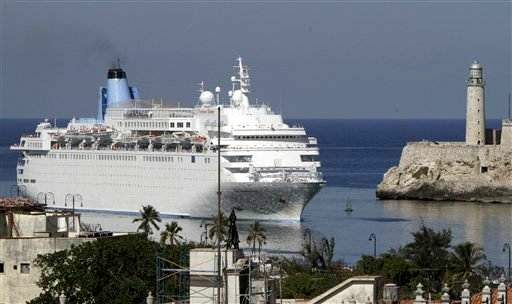 These cruises are not sold in the US as since the Cuban Revolution, the US Government has banned its citizens from travelling to Cuba and its companies from trading there, bans that have kept the big cruise lines away from the largest island in the Caribbean. Under present law, no ship calling on Cuba is allowed to trade into a US port for a period of six months thereafter. Nevertheless, there is slow progress towards a new opening up. Canada sent about a million tourists to Cuba out of the 2.8 million that visited last year. And while 900,000 Russians also visited, almost 100,000 Americans arrived in Cuba on so-called “people-to-people” visits, as charter flights have now been allowed from several US airports. The other way of cruising to Cuba is by cargo ship. Two such ships now trade between the US and Havana. One tiny ship has begun service between the Miami River and Havana but for the past ten years Crowley Liner Services has held a license to carry US Government-approved cargo to Havana. Crowley operates a single chartered ship on a sailing every Saturday from Port Everglades to Havana, Santo Tomas and Puerto Cortes – although a second may be added next month. Ships sailing under Crowley’s license are exempted from the six-month ban. The German-owned 10,700-ton K Breeze carries four passengers in an Owners cabin and two singles, and is now accepting non-US passengers for 7-day round trip freighter cruises from Port Everglades. The K Breeze is the first ship to carry passengers between the US and Cuba since September 1962, when the ferry City of Havana became the last vessel to leave Havana with American passengers after the revolution. A 7-night round trip cruise on the K Breeze from Fort Lauderdale, which includes a call at Havana on Sunday, as well as calls in Honduras and Nicaragua, costs €697 (about $950) per person. For further information or bookings on either of these Cuba cruise products, please call Miri Lopusna at The Cruise People Ltd in London on 020 7723 2450 or e-mail cruise@cruisepeople.co.uk.